The Burgs recently took a trip to our nation's capital. While we did take a couple cab rides, sadly, we did not run into that D.C. Cab. The Washington Monument is the world's tallest stone structure and tallest obelisk. And you can see that thing sticking up like a pointy finger from everywhere. See what we mean? And Erik wasn't even trying to take a picture of it in that last one. 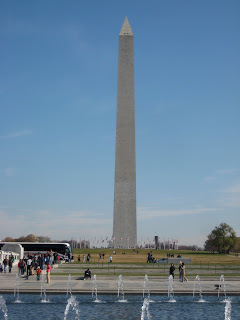 There were definitely other buildings jockeying for "Biggest Ham of D.C.", but the Monument wins by a landslide. Nice try "1600 Pennsylvania Avenue" . . . or whatever you call yourself.